Breakfast food can range from a piece of toast to a multi-course meal. Ours usually fall somewhere in-between. My mother, however, was not big on breakfasts...she usually ate after we did and only had toast and juice...in fact, I recall that she consumed it standing up...that is how little she valued her first meal of the day. She was in line with almost half of our country's population who also think that breakfast is unimportant. Current nutritional studies show that those who eat a good breakfast realize better brain power, particularly when it comes to memory. Children who are fed a nutritional breakfast produce better test scores, are not as cranky and attend school more regularly. Surprisingly, those who eat breakfast on a regular basis, maintain better body weight than those who skip that first meal. Even without the advice from nutritionists, I have always been a breakfast-person. Some of my breakfasts lean more toward fun-food, but those are served on an infrequent basis; pancakes and waffles are on that list as are coffee cakes and sweet rolls. The sugar, fat and carbs in these foods are just too hard on the human body. On the other hand...if portions are limited and servings are enhaced with fruit...the forbidden food becomes a meal of some value. 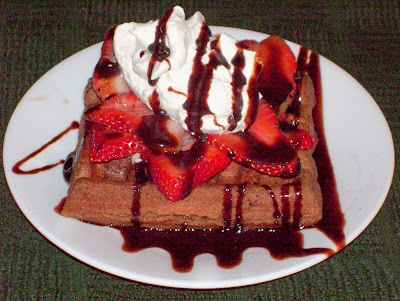 Today's post is a waffle recipe...a really wonderful chocolate Belgian dessert waffle. Make them along with your breakfast waffles, wrap and save for another day and limit your serving to one waffle...if possible! Cream butter and sugar in a medium bowl until well blended. Add eggs and beat well. Stir in melted chocolate and vanilla. In another bowl, combine the flour, salt and baking powder. Alternate addition of milk and flour mixture to the butter mixture a little at a time. Mix well. Batter will be thick. 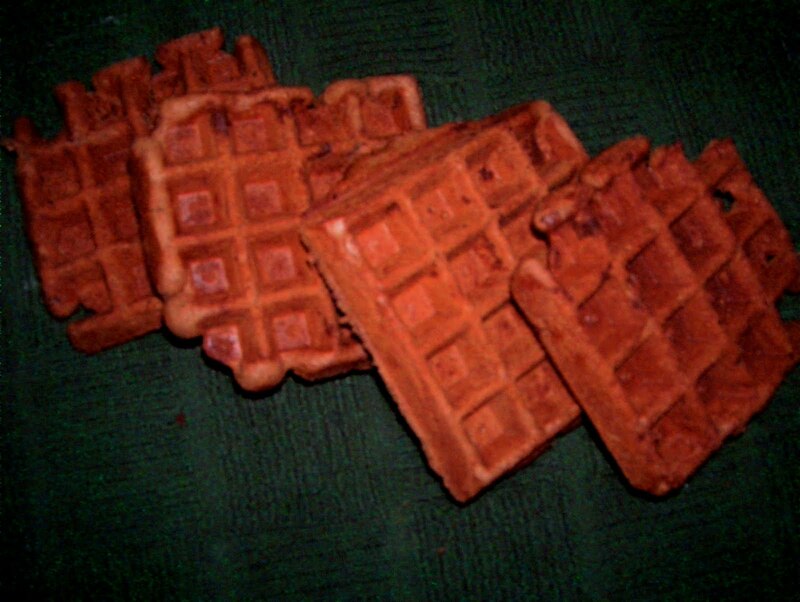 Preheat Belgian waffle iron and spray with Pam if necessary. Fill and bake according to your unit's directions. Remove to a wire rack to cool. Makes 6 Belgian waffles. *Note: The waffles are more interesting-looking if the iron is not filled to the edges. To serve: Put Belgian waffle in toaster to re-warm and crisp up. Place on a serving plate, cover with sliced strawberries (or fruit of your choice). Dot with whipped topping and drizzle decoratively with chocolate syrup.